Nice setup.. I use GitHub’s Kanban Boards. 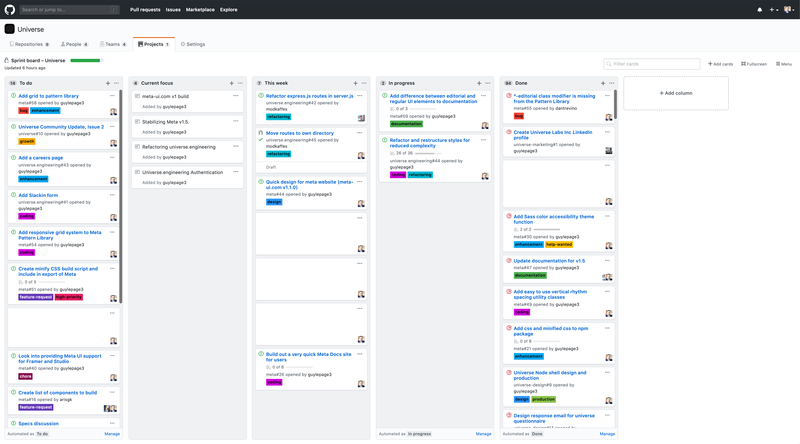 At first blush, it looks and acts very similar to Trello’s Kanban Boards. But for someone who codes, manages projects, teams, etc, GitHub’s offering allows for a healthy balance of customization while keeping things simple. For me, it reduces the number of tools I have to use in a day. I do miss a few visual cues that Trello offers like image preview’s in cards, etc. That can be quite handy. But overall, my productivity level has gone up quite a bit since switching to GitHub’s Kanban Boards. 💯Agreed.. it’s such a natural left-to-right flow… Our GitHub Kanban Board for Universe Labs… Very similar to Trello. I’ve never heard of Airtable. Looks very cool. I’ll definitely check it out. Thanks for mentioning. I’ve heard great things about Monday as well. Does it work well with code issues, etc.? Nice. And allows for github integration? Yes – I have found it easy to use and the rest of the team took to it quickly. i think we’ve all seen the ads! :) It gets annoying. Thanks Nick. I like these topics to learn other ways and see how I can learn. I will look into Airtable as it sounds intersting and had heard of it, but not tried it. I place the then critical tasks in Now and in Week to do, items on my radar but not as time sensitive or as important as what goes into the day or night of each day. I spend 5-10 min each AM and PM moving things around, closing them out. This free form, along w Evernote’s pretty solid Mac App and Mobile integration works very well for me. I have 150+ Evernote folders that is my prosthetic memory. I also use my Google Cal extensively but only for meetings and deadlines (such as filing dates, contract expiry, etc…) that are > 1 month out. Sounds like you have a system that is working for you, which is the important thing! Wow, that’s a very complicated system. If it’s a productive means to an end then all is good, but i wonder if it’s over engineered for the intended purpose(?) Do you use the telephone much (for voice) in your daily work process? I finally got my sticky little fingers on a Google Slate yesterday, the M3 processor version. It was quite nippy. I was pleasantly surprised by that. Not sure abut the keyboard though. I may give it a chance to impress me. I might :), but it just doesn’t seem very stable as a ‘laptop’ on my lap. That’s the one aspect of the design of these laptop substitutes that needs more work. I quibble. Meetings all go on the calendar, which I do a decent job of obeying. I clear through my inbox top to bottom several times a day- if its small and I can handle it quickly (under 10 seconds) I do the task immediately, anything else goes to my ToDoIst list. I have ToDoIst to Trello zap through zapier for my biggest tasks, and everything big picture goes onto my trello board. I re-prioritize trello each morning, and ToDoIst top to bottom each time I add tasks to it. I use ToDoIst to tell me what’s important and what I need to do next. Trello gives me structure so I can see big picture. I may not get as many emails as you, but I hit inbox zero daily, and (when I stick to the framework) don’t miss very many tasks at all.